Cinco De Mayo is day for partying — one of the biggest party days of the year for the people of Mexican descent. But, just as you don’t have to be Irish to party on St. Patrick’s Day or Indian to get colorful celebrating Holi, you don’t have to be Mexican to celebrate Cinco De Mayo. “Cinco De Mayo” (The Fifth of May”) commemorates the defeat of the French army by the Mexicans at The Battle of Puebla in 1862. On May 5, 1862, over 6,000 French soldiers tried to capture the forts of Loreto and Guadalupe in Puebla de Los Angeles, Mexico. Led by General Ignazio Zaragoza, 2,000 Mexican men fought back hard and held the fort. 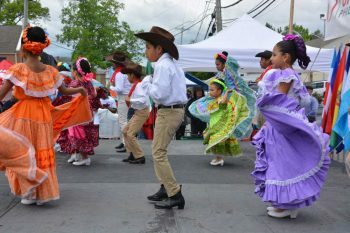 Kennett Square’s 27th Annual Cinco De Mayo Celebration (historickennettsquare.com), which will be held on State Street and Broad Street from 11 a.m.-5 p.m., is a celebration of Mexican culture. 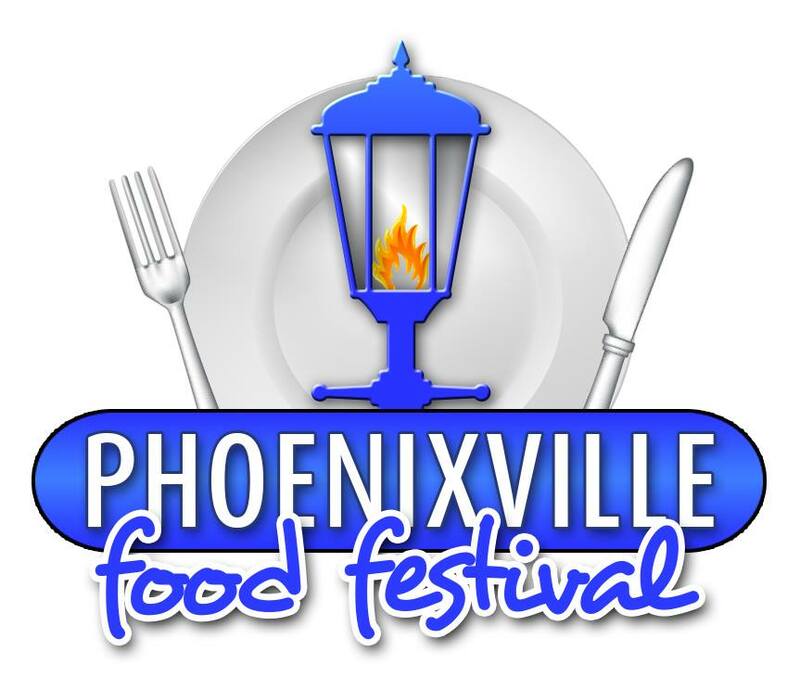 The free event features authentic Mexican food showcasing Mexican and Hispanic regional specialties with 15 restaurants. There will be a stage with non-stop live program from 11:30 a.m.-4:30 p.m. featuring music and folkloric dancing. Another attraction will be an “Education Fair” with more than 10 regional colleges and university representatives present. More than 80 vendors with a diverse offering of arts and crafts, unique merchandise and clothing. Will be set up at the event along with 30 non-profit organizations providing on-the-spot services and handing out information. The festival has been sponsored in Kennett Square since 2006 by Casa Guanajuato, a group promoting Mexican culture. One of more than 50 kindred organizations across the USA, Casa Guanajuato derives its name from Guanajuato, a state in Mexico that is the original home of many of the Mexican immigrants in the area. The event is co-sponsored by Univision65. 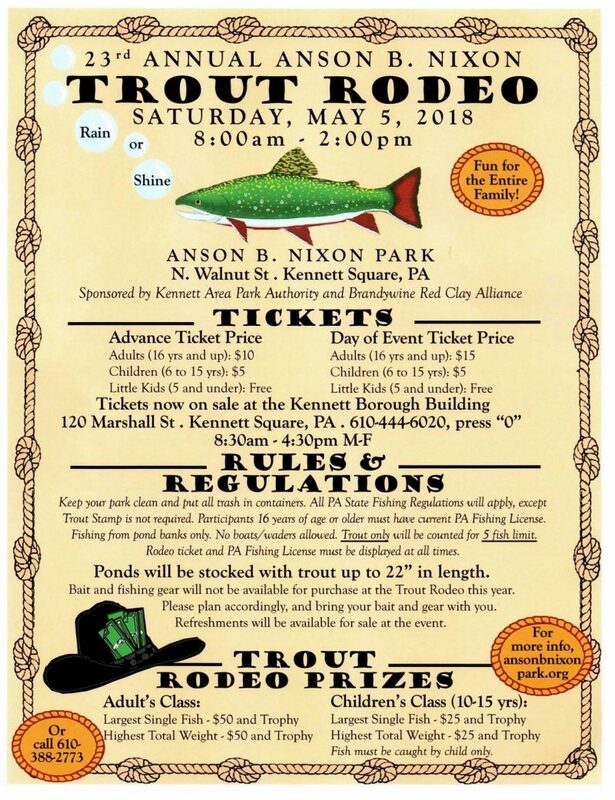 Another activity scheduled for Kennett Square this weekend is the 2018 Trout Rodeo which will take place at Anson B. Nixon Park (North Walnut Street, Kennett Square) on May 5. The 22nd Annual Anson B. Nixon Trout Rodeo (610-388-2773), which is sponsored by the Red Clay Valley Association and the Kennett Area Park Authority, will be held from 8 a.m.-2 p.m. Ponds will be stocked with trout up to 22 inches for youth and adult fishing. There will be prizes for largest single fish and highest total weight in two classes — adult’s (with a $50 prize and trophy for the winners) and children’s (with a $25 prize and trophy for the winners). Visitors are also invited to come to Kennett Square to celebrate the beginning of its weekly “Market Season” on May 4 in the heart of “Historic Kennett” form 3-7 p.m.
It’s “Meet the Maker” every week at the Kennett Square Farmers Market. Patrons enjoy getting to know the people who grow and make the food and products they purchase, and, at the same time, supporting small, local businesses. As an added attraction, Historic Kennett Square is hosting a “Flea & Artisan Market” in conjunction with the Kennett Square Farmers Market. The market will feature vintage collectors selling clothing, housewares, paper products and more. It will also showcase a selection of artists and crafters who create handmade, original work. There will be a bustle of activity this weekend at Winterthur (Route 52, Wilmington, Delaware, 302-888-4600, www.winterthur.org) with the staging of the annual Winterthur Point-to-Point Races — an event that has become one of premier attractions in the Brandywine Valley each year. This year’s 40th annual staging of the event is scheduled for May 6 from 10:30 a.m.-4 p.m. The Point-to-Point features a variety of cross country equestrian events. The main events are the steeplechase races. The races, which are on a course just over three miles long, include eight fences that are jumped 17 times. Post time for the first steeplechase event is the Isabella du Pont Sharp Memorial Maiden Timber Race at 2 p.m. — after the National Anthem at 1:50 p.m. The Point-to-Point’s other featured races will be the Winterthur Bowl at 2:30 p.m. the Vicmead Plate at 3 p.m. and the Middletown Cup at 3:30 p.m.
Video link for Point-to-Point — https://youtu.be/dLPom4ZRk6I. Tickets are $60 for adults and $25 for youth (ages 12-20). 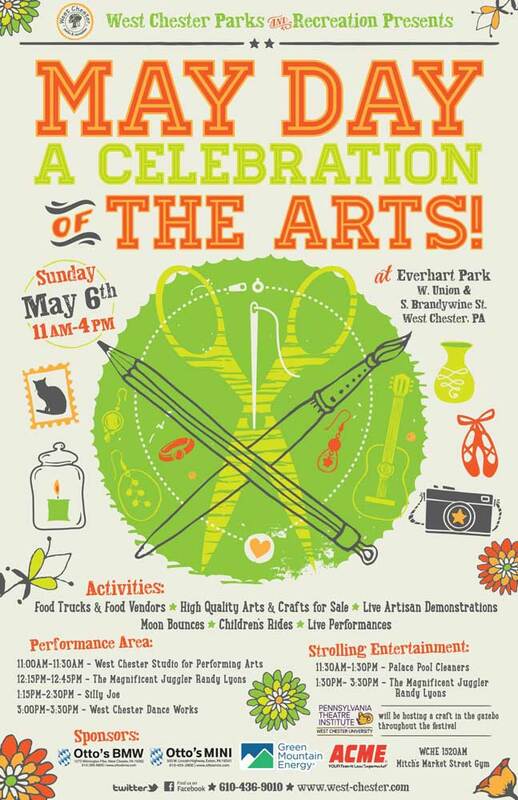 West Chester’s “May Day Festival of the Arts” will be held on May 6 at Everhart Park (West Union Street and South Brandywine Avenue, 610-436-9010, www.west-chester.com) from 11 a.m.-4 p.m.
Live entertainment in the Performance Area will be include skits by West Chester Performing Arts Studio, Silly Joe, juggler Randy Lyons and a performance by West Chester Dance Works. The line-up of strolling entertainment includes The Magnificent Juggler Randy Lyons and the Palace Pool Cleaners. 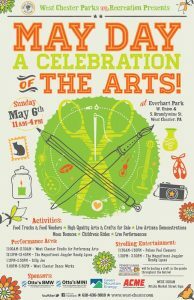 Another special event in downtown West Chester this weekend will be the West Chester Spring Gallery Walk. The popular annual event will be held on May 4 from 5-9 p.m. There will be a festival atmosphere along the streets of West Chester when area businesses feature pop-up gallery shows for local artists and six West Chester galleries will host their own art reception events. A Gallery Walk map can be downloaded at http://greaterwestchester.com/events/featured-events/gallery-walk/. 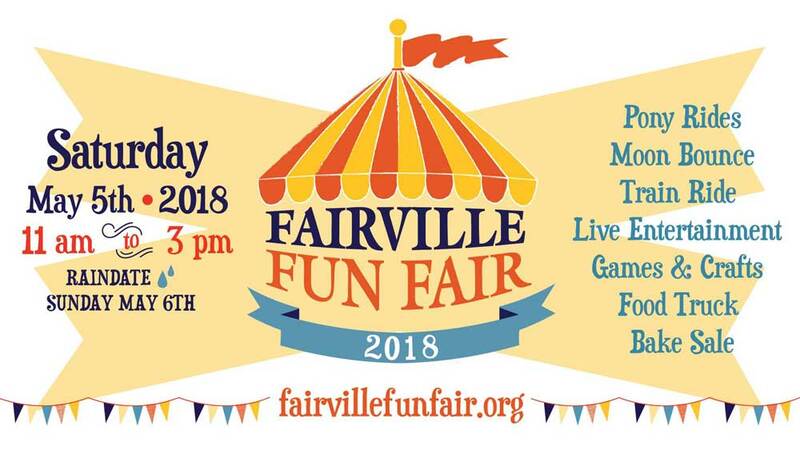 Visitors are invited to the Fairville Fun Fair, which will be held May 5 from 11 a.m.-3 p.m. at Fairville Friends School (216 Pond View, Chadds Ford, 610-388-1268, http://www.fairvillefriends.org). The Fun Fair also offers live entertainment and healthy lunch fare will be available for purchase. The Fair is open to the public with no entrance fee. 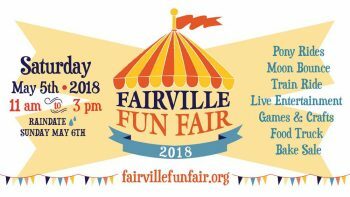 In case of rain, the Fair will be held on May 7 at the same time and location. 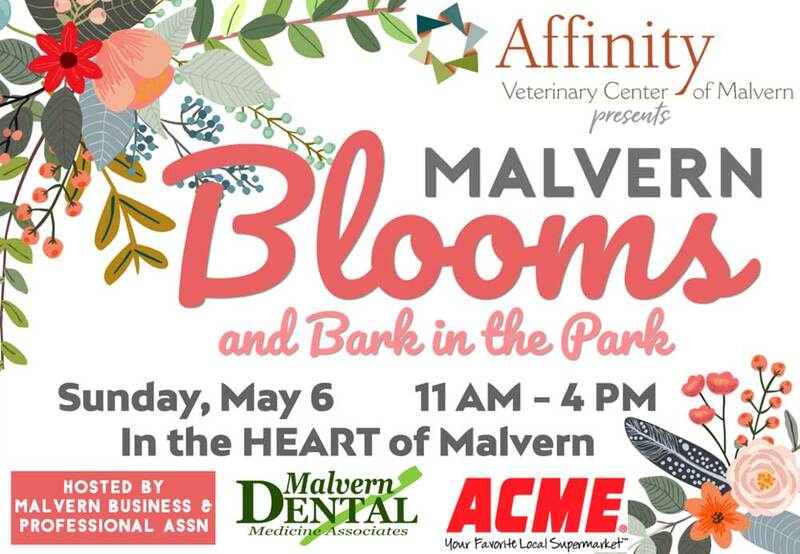 Malvern Blooms (downtown Malvern, 484-321-3235, http://www.malvernbusiness.com), one of Chester County’s popular early spring events, will be held May 6 from 11 a.m.-4 p.m.
On this special day, the Borough of Malvern will be hosting a large array of juried artists, home and garden vendors, entertainers and crafters. The event will take place along King Street, on Warren Street and in Burke Park. The street will be lined with booths, exhibits and sales displays presented by artists, local store owners and food vendors. Entertainment will be provided by Whiskey Holler and DJ Loudenclear. 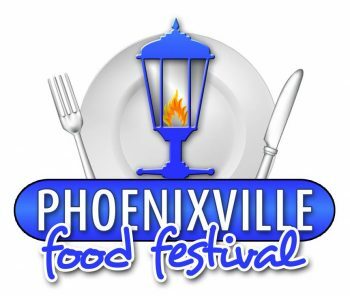 The 2018 Phoenixville Food Festival (Downtown Phoenixville including the 100 & 200 blocks of Bridge Street, Phoenixville, http://phoenixvillefoodfestival.com) will be held on May 5 form noon-6 p.m. The featured attraction will be a caravan of food trucks featuring food in a wide array of cuisines, including Mexican, Korean, French and even soul food. Some of the participating food trucks this year are Bonjour Creperie, Dump n Roll, Abuelita`s Empanadas, Ka`Chi, Molly`s Shebeen Food Truck, and Phyllodelphia. The event will also have vendors with homemade snacks and handmade arts and crafts. Freedoms Foundation at Valley Forge and the Military Living History Association are hosting the Eighth Annual World War II Weekend (www.ww2weekend.org on May 5 and 6 at the Medal of Honor Grove on the campus of Freedoms Foundation (1601 Valley Forge Road, Phoenixville). Throughout the weekend, guests in the Medal of Honor Grove can witness flag raisings, weapons demonstrations and battle reenactments by approximately 300 re-enactors. They will also be able to visit encampments and experience military life in the 1940s — and see authentic military vehicles of the times. Elsewhere on campus, visitors can hear Mae Krier, a “Rosie the Riveter” during the war; watch the Magnolia Sadies Dancers; hear Rich DeSimone singing Frank Sinatra; and enjoy a 1940s fashion show. On Saturday, from 7-10 p.m., there will be a dance featuring the West Chester Swing Kings in the Martha Washington Building on campus. The Eighth Annual World War II Weekend will run from 9 a.m.-5 p.m. on May 5 and 9:30 a.m.-4 p.m. on May 6. Admission to the event is $12 for adults (18 and up), $10 for seniors, $6 for children (ages 13-17), and $30 for families. Veterans and children 12 and under are admitted free. Tickets for the Saturday night swing dance are $12. On May 7, Sly Fox Brewing Company (331 Circle of Progress Drive, Pottstown, 484-300-4644, http://www.slyfoxbeer.com) is hosting its Sly Fox Bock Festival and Goat Race. Bock Fest runs from 11 a.m.-6 p.m. and the brewery’s tasting room will remain open until 8 p.m.
Brewmaster Brian O’Reilly and his crew produce a mouthwatering lineup of bock beers including Slacker Bock, Helles Bock, Instigator Doppelbock, two Eisbocks and a Maibock. A wide open, grassy field neighboring the 30,000 square-foot brewery is the annual site for the running of the goats and other fun festival activities. The Goat Race starts with the first heat at 2 p.m. and the competition lasts approximately two hours. The competitor that finishes as Goat Race champion goes down in history. The name of the brewery’s Maibock is named after the winning goat and ceremoniously tapped directly after the conclusion of the race. Mrs. Moogoo, Hall&Goats, Smitty Werbenjagermanjensen, Rex-a-Roni and Cheese, Marshmallow, Tosh, Marley, and Vincent Van Goat. There will be live German oompah music and live coverage of the Goat Races on a jumbotron. Afterwards, some of the goats and their owners will mingle with the crowd and get friendly with children and their families. On May 5 and 6, the Skippack Spring Wine Festival (Skippack Pike, Skippack, 610- 584-1155, http://winetober.com) will be along the main street of the scenic village near the Skippack Creek in Montgomery County. The popular annual event will feature vendors with a tasty array of wine and food samples along with live music. Wine vendors who will be participating in this weekend’s event are Mountain Lake Winery, Blue Mountain Vineyards, Juanita Valley Winery, Stone & Key Cellars, Hungry Run Wine & Spirits, Naylor Winery, A’Dello Vineyard and Winery, Village Wine Cellar – Crossing Vineyard, Bee Kind Winery, Benigna’s Creek Vineyard & Winery, Inc., Paradocx Vineyard, and Hidden Creek Vineyard and Winery. Other participants with tasting booths will be Haymaker Meadowy, Hazard’s Distillery, Gnawjaw, Stonekeep Meadery, Boardroom Spirits, Manatawny Still Works, and Stroopies, Inc. This year’s Eighth Annual Skippack Spring Wine Festival will be held from 1-6 p.m. each day. Tickets for the event, which include food and wine sampling, are $30 on either Saturday or Sunday. From May 4-6, the Broomall Fire Company Carnival will make its annual visit to Delaware County on the grounds adjacent to the Broomall Fire Company’s station (10 North Malin Road, Broomall,broomallfirecompany.com). The Carnival, which runs from 6-11 p.m. on May 4, 3-11 p.m. on May 5 and 1-6 p.m. on May 6, is free and open to the public. The event will feature a carnival midway, amusement rides, family games and a wide variety of food vendors. In conjunction with the celebration of Historic Philadelphia’s 12th anniversary at Franklin Square (200 Sixth Street, Philadelphia, www.historicphiladelphia.org ), Historic Philadelphia is once again illuminating the park with its Chinese Lantern Festival. 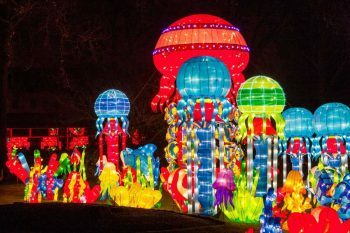 Now through June 30, Franklin Square will come alive every night with more than two dozen illuminated lanterns – all constructed by lantern artisans from China. Chinese-inspired performances will take place in Franklin Square twice nightly. Performances, which celebrate Chinese performance art and entertainment, are 30-minutes long and are scheduled for 7 and 9 p.m. The Haverford Spring Fest (Brookline Boulevard, Haverford, haverfordspringfest.com) will take place on May 6. The festival’s main stage attractions will be Mark Shepperd (National Anthem), Haverford High School Jazz Ensemble, Katie Sharbaugh, Dylan McGuire, Earth Wonder Fire, Rob Simpson, Elton Rohn, Scott McClatchy and Live at the Fillmore. In addition to live music, the one-day festival will feature artisan vendors, food vendors, beer/wine gardens, an inflatable park, and an array of children’s activities. A donation is requested at admission. The Yellow Springs Art Show, which is still free and open to the public, is celebrating its 45th anniversary this year. The popular annual event now features more than 185 participating artists — including 23 artists who are new to the show this year. The show is running now through May 13 in Historic Yellow Springs Lincoln Building (Art School Road, Chester Springs, 610-827-7414 or www.yellowsprings.org). Show hours are from 10 a.m.-4 p.m. daily. The 2018 Yellow Springs Art Show will have on display over 3,000 pieces of fine art in a wide range of media and styles – oils, watercolors, bronze sculptures, pastels, landscapes, still life, three-dimensional works, seascapes and abstract. 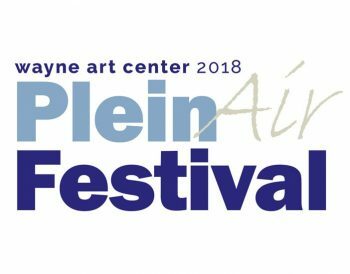 The 12th Annual Wayne Art Center Plein Air Festival will be held from May 6 – June 30 at the Wayne Art Center (413 Maplewood Avenue, Wayne, www.wayneart.org). The event will get underway with the “Artist and Sponsor Welcome Dinner and Orientation” on May 6. “En plein air” is the act of painting outdoors. This method contrasts with studio painting or academic rules that might create a predetermined look. The practice goes back for centuries but was truly made into an art form by the French Impressionists. On May 12, May 12, there will be a “Community Paint-Out” during the day followed by the “12th Annual Wayne Art Center Plein Air Collectors’ Soiree” form 6-10 p.m.
On May 5 and 6, it will be time for the annual Lancaster City Art Walk (vicinity of Prince and King streets, Lancaster, lancasterartwalk.org). Special exhibitions, meet-the-artist events, children’s activities and live demonstrations are all available for discovery within the bustling independent galleries of Lancaster city. Art Walks have a long history in the City of Lancaster. Back in 1965, the first art walk was organized by the Community Gallery, now the Lancaster Museum of Art. The event was called Art Sunday and occurred on the first Sunday in October. It was a special day for promoting local artists and galleries and included both city and county venues. Arts venues were less commonplace at that time. Downtown was a quieter place and there were no First Fridays. Thanks to the Community Gallery/Lancaster Museum of Art, Art Sunday continued every year and became well-established. Featured Stops at the 2018 Lancaster City Art Walk will be fine art galleries, edgy and indie boutiques, fine craft stores, co-operatives, art centers and museums. Longwood Gardens (Route 1, Kennett Square, 610-388-1000, www.longwoodgardens.org) has “Spring Blooms” running through May 6. Visitors can enjoy hundreds of lush acres featuring burgeoning gardens of daffodils, tulips, magnolias, azaleas, flowering cherries and more than 240,000 flowering bulbs. Some of the popular blooms right now are Azaleas and Marguerite Daisies. Wilmington Garden Day, a springtime tradition in the Brandywine Valley, will host its 71st annual tour on Saturday, May 5, from 10 a.m. to 4 p.m. Featuring both houses and gardens, this is a rain-or-shine event. This year’s Wilmington Garden Day tour (http://www.wilmingtongardenday.org/) will offer participants the opportunity to visit 14 colorful — and very different — gardens. Of those, seven will include the home’s interior and/or greenhouses. Wilmington Garden Day has been using its proceeds to benefit underserved children in Delaware for 49 years. Tickets for this year’s tour are $30. A popular event in Delaware this weekend is “Train Day” at Auburn Heights Preserve (3000 Creek Road, Yorklyn, Delaware, 302-239-2385, http://auburnheights.org). “Train Day,” which is scheduled for May 6, celebrates all things train — big and small – with special guests and elaborate model railroad layouts. Planned activities include rides on the Auburn Valley Railroad featuring the site’s 1/8-size live steam and diesel locomotives and a display of 1930 electric trains in the Marshall Steam Museum. There will also be special exhibits spotlighting early track tools, the history of the Auburn Valley Railroad and more. The model railroad layouts will be provided by the Nordel Model Railroad Club. The event is scheduled to run from 12:30-4:30 p.m. and admission is $8. The event will run from 9 a.m.-3 p.m. both days with viburnums as the featured plant. As an added attraction, “Plant Experts” will be available throughout the day on Saturday and Sunday to offer advice. Offering luscious plants to suit all gardens, soil types, growing conditions, gardening abilities, and pockets, Tyler’s Annual Plant Sale provides inspiration for the garden, with showy annuals for containers, herbs, edibles, flowering shrubs, trees, unusual vines, and rare and difficult to find plants. n May 6, it will be time for “First Sundays for Families” at the Brandywine River Museum of Art (1 Hoffmans Mill Road, Chadds Ford, www.brandywine.org). Billed as “Once Upon a Masterpiece,” the event will entice visitors to join in the fantasy of folklore and fairytales through hands-on art activities inspired by illustrations from the Museum’s collection and to participate in “Folktale Fun” with internationally acclaimed storyteller TAHIRA. TAHIRA is a storyteller, musician and vocalist whose high-energy performances delight listeners of all ages. She had the prestigious honor of representing the National Association of Black Storytellers, Inc. at the internationally acclaimed festival “Panafest,” which was held in Accra, Ghana. Guests at the event will also be able to take part in as “Meet and Greet” with Rapunzel. There will also be art activities with teaching artists. Children of all ages can make their own fairy-tale finger puppets, create a friends-and-family coat of arms and assemble a wearable crown or hat. The event will run from 11 a.m.-2 p.m. Museum admission is $18 for adults, $15 for seniors (65+) and $6 for students with ID and children ages 6-18. On May 5, one of Montgomery County’s most popular historic sites will celebrate the arrival of May. Pottsgrove Manor (100 West King Street, Pottstown, 610- 326-4014, www.historicsites.montcopa.org) is hosting a Colonial May Fair on May 5 from 11 a.m.-4 p.m. The event will feature 18th-century entertainment, including May Pole Dancing Milkmaids’ Garland Dances along with performances by Tucker’s Tales Puppet Theater and Levram the Great. Tucker’s Tales Puppet Theater is an Abington-based performing company founded in 1981. Co-directors Marianne and Tom Tucker have performed at puppet, folk, ethnic and street festivals as well as at craft fairs, shopping centers, theaters and schools around the country. Levram the Great is a local magician who bills himself as the “Official Colonial Conjurer of Philadelphia.” The Colonial May Fair hosts a number of early American crafters who will be demonstrating their crafts and selling their wares. There will also be games and contests for youngsters. The list of hands-on activities includes trap-ball (a predecessor of baseball), colonial toys and games, fortune-telling by “Madame Fortuna,”, kid-sized Maypole, beanbag toss games, churning butter and free spring-themed make-and-take crafts. Visitors will also be able to tour the manor house which features the early Georgian architecture that was popular with wealthy English gentry during the mid-18th century. It was built in 1752 for John Potts (ironmaster and founder of Pottstown) on a 1,000-acre plantation. Admission to the event is free but there is a $2 suggested donation. The annual South Street Spring Festival (http://southstreet.com) will close down South Street from Front Street to Eighth Street on May 5 from 11 a.m.-8 p.m. The free festival will feature food, music and a variety of family activities. Live entertainment will be provided all day with a line-up of approximately 20 music acts. Affiliated events in the area on Saturday include the Second Annual Philly Taco Eating Contest, the Third Annual Atomi-Con and Maifest at Brauhaus Schmidtz. Also on May 5, Cliveden, a historical home in the northwest outskirts of Philadelphia, will host the 48th Annual Mt. Airy Day from 11 a.m.-5 p.m. The event, which will be held on the grounds of Cliveden of the National Trust (6400 Germantown Avenue, Philadelphia, http://www.mtairyday.org), will offer a day of fun for the whole family with delicious food, live entertainment, great shopping, kids’ games and more. A day later and a few blocks away, visitors to this section of Philadelphia will be able to enjoy the 22nd Annual Chestnut Hill Home and Garden Festival (Germantown Avenue from Rex to Willow Grove avenues, Philadelphia, https://chestnuthillpa.com ). On May 6, Germantown Avenue in Chestnut Hill will be a bustle of activity when the annual street festival returns. The popular annual event will feature live entertainment, gardening experts, landscape and flower displays, vendors and al fresco dining. The free event is scheduled to run from 11 a.m.-5 p.m.
On May 4 from 5:30-7:30 p.m., the Eastern State Penitentiary (2027 Fairmount Avenue, Philadelphia, www.easternstate.org) is hosting an after-hours reception for the new artist installations which will be on display in 2018. This event, which is free and open to the public, includes a preview of the new featured works, a meet-and-greet with the artists and light refreshments. Visitors will have the opportunity to preview three new artist installations and meet the artists themselves. New artist installations include “Photo Requests from Solitary” by Solitary Watch with Jean Casella, Jeanine Oleson and Laurie Jo Reynolds; “Doris Jean” by Rachel Livedalen; and “An Electric Kite” by Provisional Island. A special event at a Berks County “homestead” on May 5 will be the “Artisans in The Park at Conrad Weiser Homestead” (28 Weiser Drive, Womelsdorf, 484-335-0091, www.artisansinthepark.com). The “Artisans in The Park” is an Annual event that takes place the weekend before Mother’s Day to help raise money to assist the Friends of the Conrad Weiser Homestead with the upkeep and improvement of the beautiful, historic Conrad Weiser Homestead. The Conrad Weiser Homestead is a privately funded Pennsylvania state historic site that interprets the life of Conrad Weiser — an 18th-century German immigrant who served as an Indian interpreter, helped coordinate Pennsylvania’s Indian policy and played a major role in the history of colonial Pennsylvania. The Conrad Weiser Homestead is located on 26 acres of land. Seven total buildings exist on the property with three open for touring. Two large monuments, a gazebo, the Weiser Family Cemetery, and a pond are also on the site. Admission is free, and the event will be held rain or shine. For and event that is both fun and educational, consider the Archaeology and Heritage Festival on May 6. Visitors to the festival will be able to learn about cooking styles of early settlers, dig with professional archaeologists and watch colonial craftspeople do blacksmithing, lime mortar making, brewing, and spinning. The 2018 festival, entitled “Growing and Gathering: Farming on Iron Hill,” will highlight historical foodways and methods of archaeology, as well as the history of the area and what archaeologists might find out about food growing and preserving from the native people to the modern farming techniques. This family-friendly event will include a demonstration from John Dickenson Plantation, flint knapping demonstrations and blacksmith demonstration, archaeology excavations and demonstrations, cooking and historical brewing demonstrations, and museum & science center tours. Food trucks will be available. Also, just for the little ones, there will also be corn husk doll making and archery. Held in coordination with Delaware Archaeology Month, the 2018 Archaeology & Heritage Festival is sponsored by the Delaware Academy of Science, and the Delaware Division of Historical and Cultural Affairs. Delaware Archaeology Month is designed to promote the study and conservation of Delaware’s archaeological resources and to reflect on the vital role of archaeology in revealing the cultural legacy of the state. Local and state wide historical societies will also be in attendance to talk about their findings and upcoming events. Admission to the museum and event is $5 for adults and $4 for students and children. The Ardensingers have been presenting the works of Gilbert & Sullivan continuously since 1948 at their historic Gild Hall (2126 The Highway, Arden, Delaware, 484-319-2350, www.ardensingers.com). Now through May 5, the Ardensingers are performing Gilbert & Sullivan’s “Patience” — one of the team’s legendary musical comedies. “Patience,” which is also known as “Bunthorne’s Bride,” is a comic opera in two acts with music by Arthur Sullivan and libretto by W. S. Gilbert. The opera is a satire on the aesthetic movement of the 1870s and ’80s in England and, more broadly, on fads, superficiality, vanity, hypocrisy and pretentiousness; it also satirizes romantic love, rural simplicity and military bluster. First performed at the Opera Comique, London, in April 1881, “Patience” moved to the Savoy Theatre in October 1881, where it was the first theatrical production in the world to be lit entirely by electric light. Here’s the story of “Patience” — Just one year ago the young ladies in the village were engaged to soldiers in the 35th Dragoon Guards, but they’ve since embraced “aestheticism” and have lost their hearts to the “fleshly” poet, Reginald Bunthorne. In a private moment, Bunthorne reveals that he’s actually an aesthetic sham, but craves the attention he receives as a poet. He’s in love with the simple village milk-maid, Patience. When the Dragoon Guards arrive in the village on leave, they’re bewildered by the change of circumstances, and the equilibrium is further upset by the arrival of an “idyllic” poet, Archibald Grosvenor, who was a childhood friend of Patience. With two poets as rivals, the Dragoon Guards determine to become “aesthetic”, too, if that’s what it takes to win the women’s hearts. In typical G&S fashion, everybody is paired with a suitable partner by the end of the play. It is a light-hearted spoof of all who take their art a little too seriously. Performances are scheduled for May 4 at 8 p.m. and May 5 at 2 and 8 p.m. Tickets are $20 for adults, $17 for seniors and $7 for children. The roster of special guests includes Jad Saxton, Jessica Calvello, Greg Wicker, Sarah Wiedenheft , Quinton Flynn, Phil LaMarr, RedKunoichi , Hi5, Emily Breinich, Amanda C, and Diana Hong. Tickets prices are $60 for “Three-day,” $50 for Saturday and Sunday combination and $25 for Sunday only. “Take Me Out to the Ballgame” is something you might hear from your kids as the summer progresses. This weekend, “Take Me Out to the Ballgame” is something you might hear from your pets. On May 6, The Lancaster Barnstormers (Clipper Magazine Stadium, 650 North Prince Street, Lancaster, 717-509-3633, http://www.lancasterbarnstormers.com) will play the York Revolution at 1 p.m. But, the event with more wow factor – make that bow-wow factor – will start an hour earlier at the stadium in downtown Lancaster. Baseball fans are invited to join fellow pet lovers for “Pet Fest” at Clipper Magazine Stadium. The special animal-friendly event is being presented by Lancaster County Pet in association with the Lancaster Barnstormers. Dog owners are invited to bring their dogs to the ballpark to enjoy an afternoon Barnstormers game, participate in a pre-game dog parade and visit with several Lancaster County pet businesses and organizations. 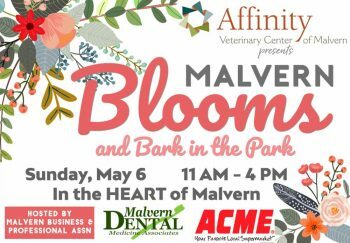 Participating businesses and organizations will be Lancaster County Pet, Lancaster Police K9 Unit, Landisville Animal Hospital, Manheim Pike Veterinary Hospital, Neffsville Veterinary Hospital, PA Boxers, Sits and Tricks, Uptown Petz, and West Lancaster Animal Hospital. If you are attending and bringing a dog along, you are requested to purchase a Lawn Area ticket – which is $8.